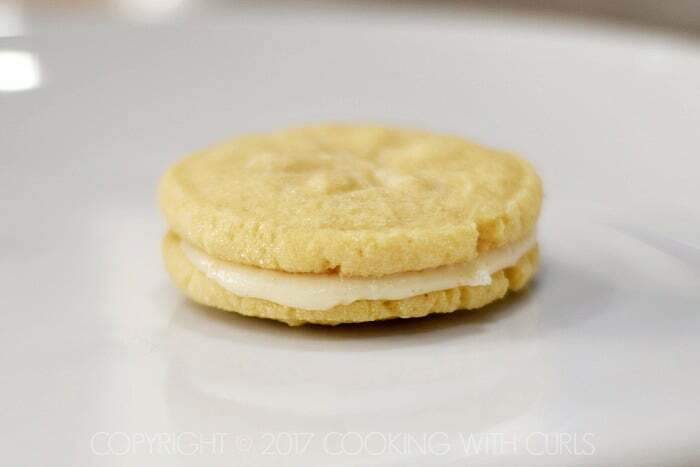 We have officially entered cookie baking season and I am starting off with one of my favorites, Caramel Cream Sandwich Cookies. 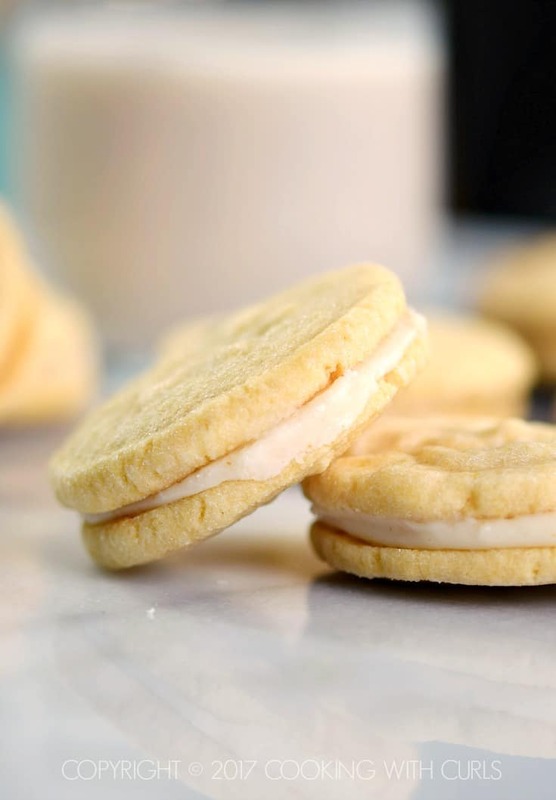 Rich browned butter frosting is sandwiched between two tender brown sugar cookies and the combination is amazing!! 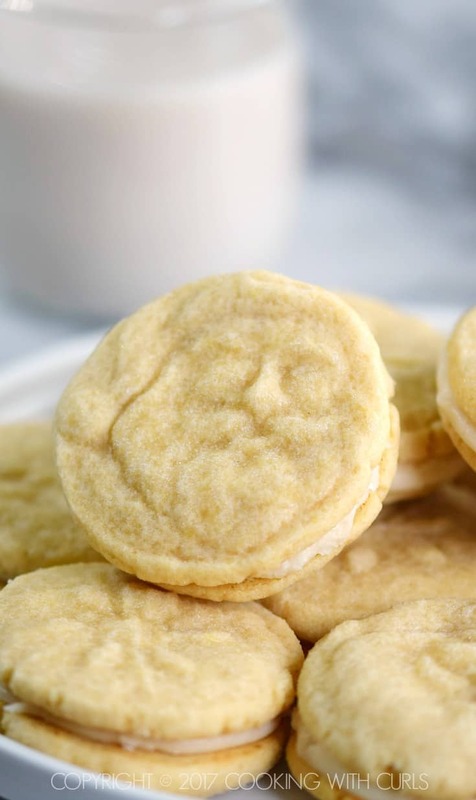 These cookies melt in your mouth and scream out for a big glass of ice cold milk….. 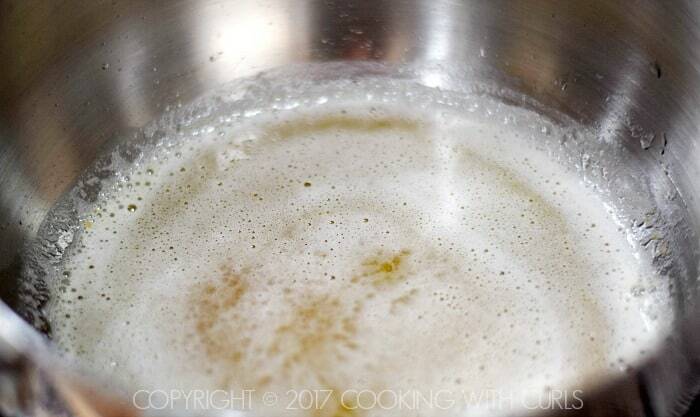 Beat the butter and brown sugar together until light and fluffy…..
Add the egg yolk and mix well. Add the flour and beat until dough is combined and forms a ball*…..
Wrap with plastic wrap and chill for 1 to 2 hours. Preheat oven to 325 degrees. Line 3 baking sheets with parchment paper, set aside. Roll dough into 3/4-inch balls and place on prepared baking sheets**. 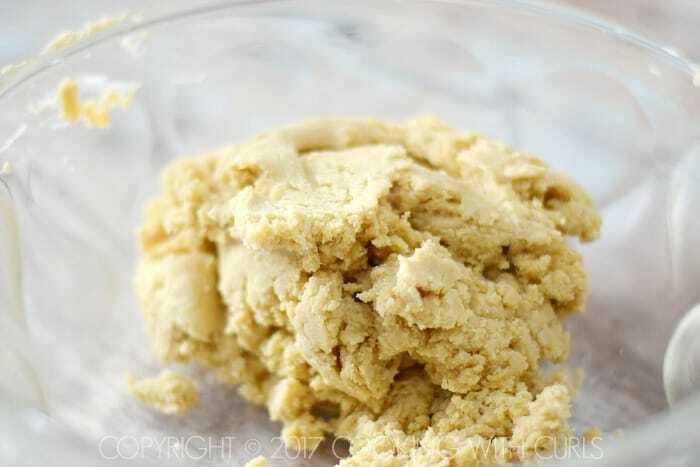 Flatten each dough ball with a cookie stamp or the bottom of a glass that has been dipped in granulated sugar…..
Bake for 8 to 10 minutes…..
until the cookies barely start to turn brown around the edges. Remove from baking sheets and place on a wire rack to cool. 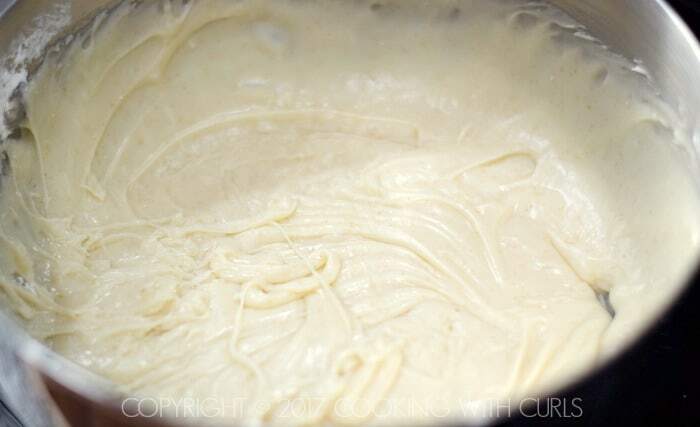 Melt butter in a medium sized saucepan over LOW heat…..
Lightly simmer until butter just begins to turn brown. Watch it carefully so it doesn’t burn! 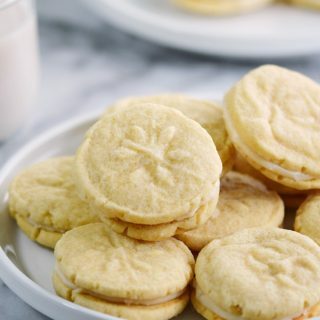 Remove from heat and mix in the powdered sugar, vanilla, and cream…..
Place a small spoon full of frosting on a cookie…..
Then top with a second cookie…..
*If you live in a dry climate like I do, you may need to add 1 to 2 Tablespoons of milk to the dough if it is too dry. My brown sugar was very dry and crumbly, almost like sand in texture. 2 Tablespoons of milk pulled the dough together perfectly. 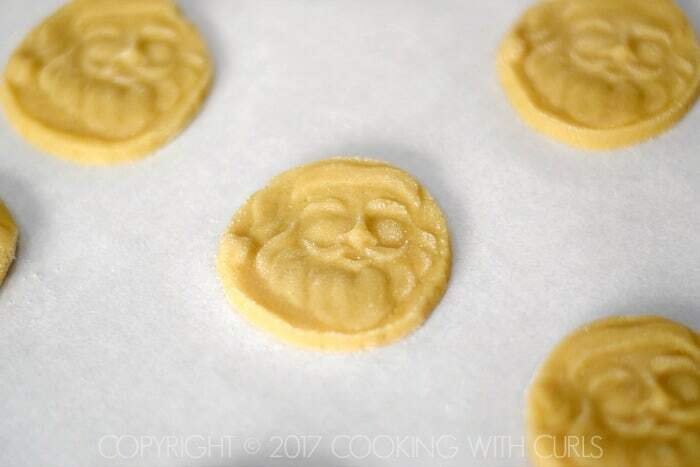 **If you are using a brand new cookie stamp it will tend to stick to the cookie dough. Roll your dough balls in granulated sugar before pressing them to keep the stamp from sticking. 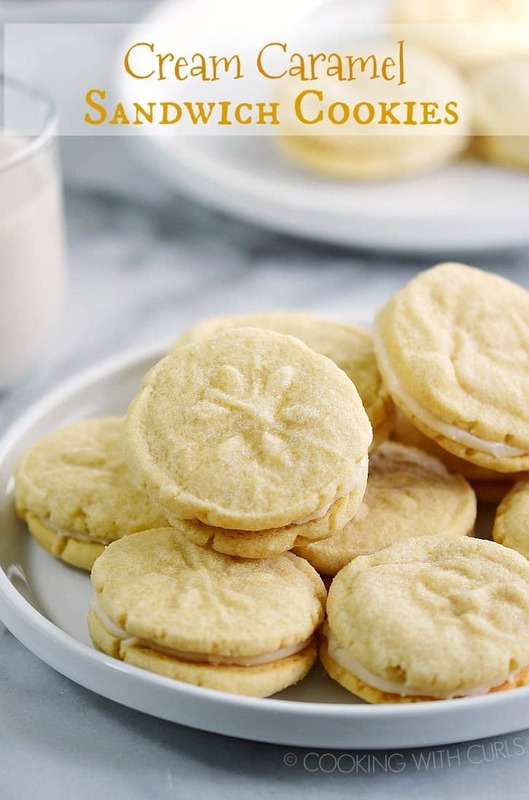 If you do not have a cookie stamp, you can press your cookies with the tines of a fork like you do when making peanut butter cookies. 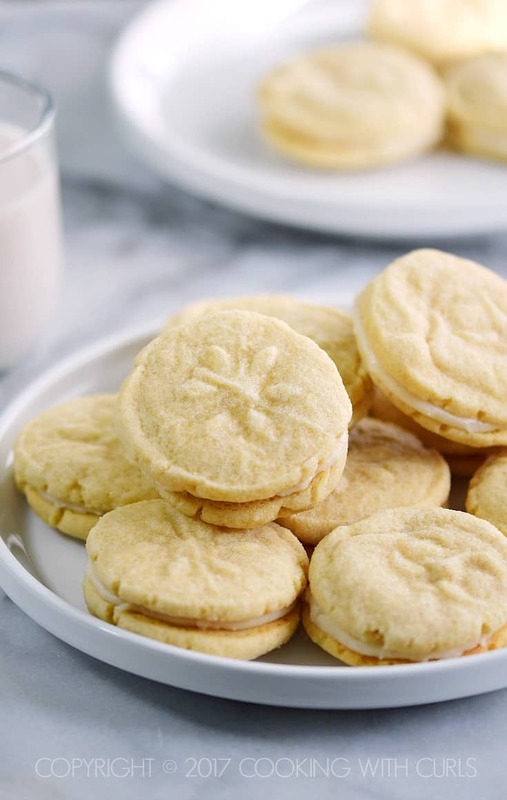 These Caramel Cream Sandwich Cookies are not just for the holidays, use whatever shaped cookie stamps you like, or just use the bottom of a glass. Try to press down evenly or your cookies will be lopsided. If you press down too hard your cookies will be too thin and the shapes will get distorted. Candy Cane Cookies – my all-time favorite! Show Santa how good you have been this year by leaving him a plate of these delicious Caramel Cream Sandwich Cookies with a glass of milk! Beat the butter and brown sugar together until light and fluffy. Add the egg yolk and mix well. 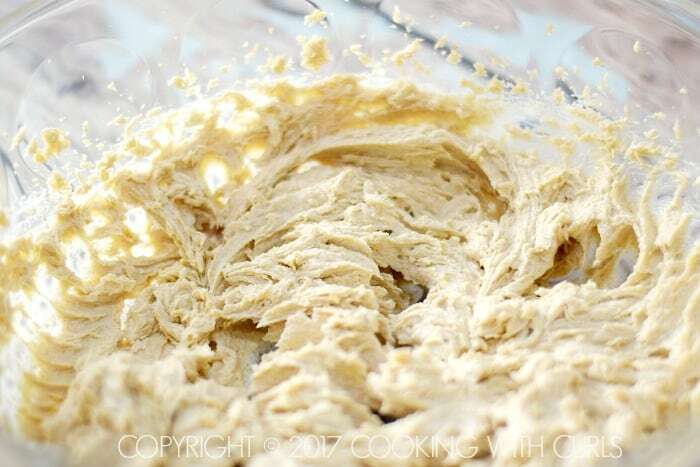 Add the flour and beat until dough is combined and forms a ball*. Roll dough into 3/4-inch balls and place on prepared baking sheets**. Flatten each dough ball with a cookie stamp or the bottom of a glass that has been dipped in granulated sugar. Bake for 8 to 10 minutes until the cookies barely start to turn brown around the edges. Remove from baking sheets and place on a wire rack to cool. 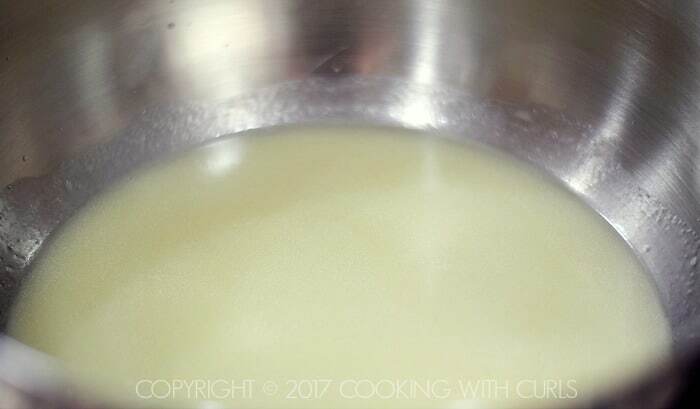 Melt butter in a medium sized saucepan over LOW heat. Remove from heat and mix in the powdered sugar, vanilla, and cream. 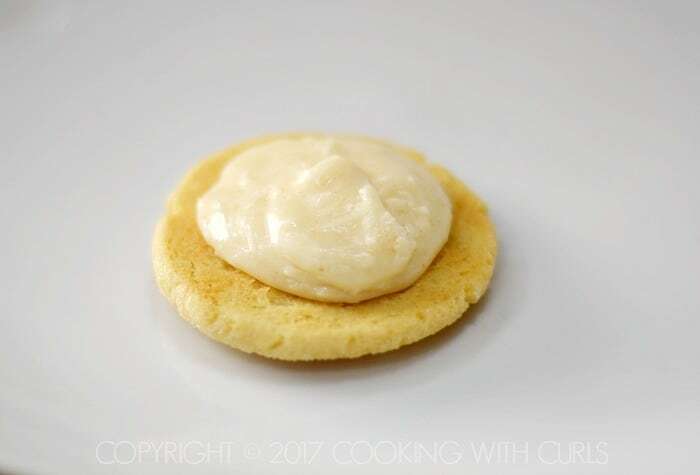 Place a small spoon full of frosting on a cookie. Then top with a second cookie. 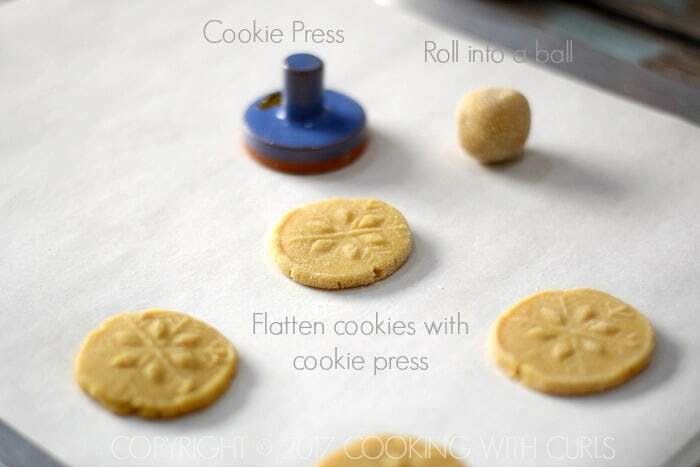 I have a cookie press like this and think I have only used it once or twice. Now I want to pull it out and use it to make these cookies. YUMMMMM!